Results elsewhere saw Little Common Football Club slip into the relegation zone despite a battling 0-0 draw at home to fellow strugglers Arundel yesterday (Saturday). 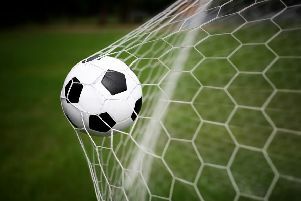 The Commoners slipped to second-from-bottom of the Southern Combination Football League Premier Division after Loxwood won away to Lingfield to jump above them. Common were forced into one change from the previous weekend’s 2-0 loss against Saltdean United, with Ryan Alexander replacing the unavailable Lewis Parsons. A slight reshuffle saw player-manager Russell Eldridge move into a midfield role. It was Eldridge who had the first opportunity of the match after just two minutes, but his effort from a tight angle hit the side-netting. The Commoners dominated possession in the first half and spent long spells in Arundel territory, but were unable to create any real chances of note. Eldridge screwed an effort wide after a neat lay-off from Wes Tate and Adam Smith volleyed a snap-shot wide. The visitors failed to create a chance of real note in the first period and the Common defence dealt well with any counter-attacks which did come their way. The second half was a much more even affair, with Arundel growing into the game and enjoying spells of sustained pressure, particularly when getting the ball wide and delivering crosses into the Common area. Arundel saw a glancing header drift wide of the post before a low cross was palmed away by Common goalkeeper Matt Cruttwell, with the follow-up being hacked to safety off the goal-line. In what was now a more end-to-end encounter, Common had a glorious opportunity to open the scoring when Eldridge’s throughball released Jamie Crone, but as he went one on one with the goalkeeper, he lifted his shot over the bar. Arundel saw a free kick just clear the upright and then missed a one on one of their own when Cruttwell made a smart save before the rebound cannoned off the crossbar. Common pushed forward in search of a late winner of their own. Sam Ellis saw the ball bounce unkindly after receiving a pull-back in the area and Eldridge’s last minute effort was fumbled by the visiting goalkeeper, who recovered to grab the loose ball from Lewis Hole. Common: Cruttwell, Weeks, Feakins, Ward, Paul, Alexander, Tate, Eldridge, Hole, Crone (Tewkesbury), Smith (Ellis). Southern Combination League Premier Division bottom six (played-points): 15 Langney Wanderers 28-24 (-26 goal difference), 16 Loxwood 27-21 (-28), 17 Shoreham 28-21 (-33), 18 Arundel 27-20 (-38), 19 LITTLE COMMON 27-19 (-25), 20 Eastbourne United AFC 27-18 (-42).